Reese and I arranged with Dillon and his mom for the boys to wear their matching "Feed Me" shirts to school today. While looking at this picture just now, I considered how unbelievable it is that I never went to preschool, hadn't considered it for my own children until shortly before sending Griffin, and now it is such an important part of our lives! Griff's class has two traveling mascots: a stuffed Cat in the Hat, and a plush Curious George. Every weekend, two children are randomly selected to take home the toys and document their adventures in a journal. 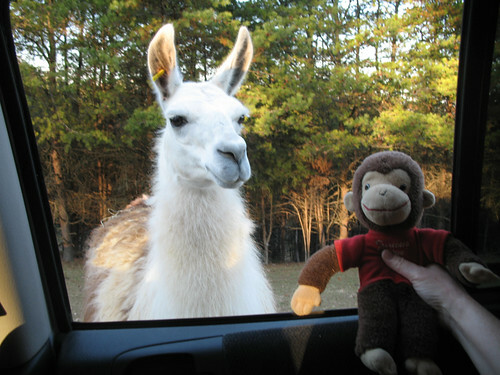 Griff has been hoping that he would get to bring Curious George home, and on Friday, his name was picked! Perfect timing, because he had plans to travel to Virginia Safari Park in Natural Bridge with my parents and then have an overnight stay at their house. George attended a soccer game before heading off on his adventure. According to the photographic evidence collected by his handler, they came into close contact with many species, including llamas, camels, water buffalo, deer, zebras, and at least one ostrich. First game of the season. Griff went up to U8 from U6 this year, which means no more bunchball and tiny goals - the under-8s (over-6s) use regulation-sized fields and goals and learn about playing specific positions. To mark this transition to more serious soccer (a change from our dabbler season in U6 to see if he liked it) I took Griff cleat shopping, a failed expedition that ended with my having to buy three pairs from Zappos, hoping one would fit. Only one did, and as luck would have it, they're the coolest pair, that apparently make him run faster and jump higher. His team was bested 5-0 (I'm going to fault the league for this - G's team is all 1st graders and this team was mostly bigger, more experienced 2nd graders, no fair!) but their spirits were not dampened. I wish I could say the same for Dan, who spent much of the game handling a colossal Reese-style meltdown. At least Xander had fun, exclaiming "soccer ball!!!" and showing me his best dribbling skills. The kid is ready to play. ...oh, and brandishing his new stick "gun", too. Lovely. He was pointing it at a neighbor there and I had to suggest that perhaps she might not like being shot at by the neighbor kid. You know, the neighbor kid whose mother was photographing him pointing a weapon at people. Niiice. Have to admit, though, this stick makes a particularly awesome gun. Back to school: he had a great day, building inside, having a picnic snack on the carpet, and visiting the forest. And apparently he taught his class the Witch Doctor song! Flexibility is the name of the game now that he has turned the corner from three to four. While he's still our same old creature-comforts Reesie, he's increasingly able to go with the flow, looking forward to going to familiar places, handling new situations with more ease, and changing course and handling frustrations with much more grace. This is not to say that he has become a laid-back and ultra-compliant kid - I'm sure he'll retain his spirit for as long as he lives - but this summer marked a real shift for him in being able to go out and enjoy the world around himself. Returning to Sabot has thrown a spotlight on the big changes that happened over the last three months: he has had a HUGE language boom, and a surge of confidence and independence. Last week his half-hour visit to his new classroom was probably the most fun date I've had with him, ever. He beamed as he headed straight down the path to his classroom, immediately greeted one of his teachers (Kara, who worked as a social coach in his classroom last year and who has a fantastic bond with Reese) and showed her a dead cicada he had brought, then went and engaged in several different classroom activities. No hesitation, just a total sense of knowing this place and being comfortable there. I noticed that he's interacting more with other kids, and with the materials in the classroom. Kara observed the big jump in language skills and she and I also discovered at the same time that he might be doing some addition - he showed me some magnifying glasses and said something about the five of them, and while I was trying to decide whether to correct him (I only saw three), he said "three here, and two over there. Five magnifying glasses." Huh. Didn't know you could do that, kid! Along with this new ability to manipulate numbers is some interest and skill in building. In the last few days he has built long winding railroad tracks and a block configuration he calls a "PacMan maze" after the style of the pathways in the arcade game that he loves to watch us play at New York Deli. This is a big change coming from a kid who has never really shown an interest in construction-type play. Interest in puzzles is starting to appear, interest in body systems, careful balancing of marble runs, and more elaborate pretend-play scenarios. Reading might also be starting to click. This afternoon while reading a naptime story to Xander, Reese was following along the words with a finger and seems to have the idea of one written word representing one spoken word, even picking out a couple of the words for me when I asked him which word looked like "fuzzy" or "soft". No interest in writing yet, although maybe the sign-in sheet at school will help to encourage that. He does like to spell his name. I noticed the other day that Reese asks questions in a way that Griff never has. Griff observes and draws conclusions; he connects data points. Reese generates questions, with each answer leading him to a new question. He wants specificity - exact names for things, exact answers to questions - and is quick to determine when facts given to him don't fit a particular situation, and to inquire about it. The overall sense I get from Reese these days is one of emerging competence and control, and it's really fun to watch this process unfold. Um, so, the first day of summer vacation was fair-to-sucky, with an overtired mama (going to bed before midnight might be good), cranky younger children (yay, DTAP vaccine), a rainy day, a forgotten preschool playdate, a cancelled later playdate, too little nice interaction, too much touching each other, much screen time...you get the picture. It wasn't awful, but it wasn't great, either. So we'll talk about something else: the school photos I've been meaning to scan all year long and didn't get to until tonight. Yay! This year for the first time we gained experience with both pay-in-advance school photos (Sabot & Munford fall, Munford class photo), speculative packets sent home (Munford spring) and online ordering after the fact (Sabot class photo). The results: I think perhaps I should go into the school photography business. You don't even have to take a good photo, and parents will shell out money! Well, perhaps not this parent. In the future, I think I'll buy only class photos (worth the memories) and take my own portraits. Ok, maybe I will continue ordering these, just a copy for myself. There's something terribly honest about them, isn't there? Griff didn't fare much better. His fall photo (left) doesn't even look like him! I think perhaps it isn't him. They took his hair and shirt and put them on some other kid. What is that expression, and why did the photographer not, I don't know, crack a joke or something before pressing the shutter? Griff's an easy mark for a knock-knock joke, it's not hard to get a genuine smile. Just try. Yeah. The more I think of it, the more I'm convinced that's not even Griff. The spring shot (right) is actually kindof cute - nay, if I dare say, beautiful, in this cheesy and angelic way. He still had his Prince Valiant / Leif Garrett hair and I love having it recorded this way. He suddenly decided to get a short hair cut just a day or so later. Here's the class photo, including everybody right down to Lily Callis the class pup. She's fairly legendary - when you talk about teachers and Ms. Callis' name comes up, people ask, "is she the one with the dog?" I wonder what we'll remember when we look back at these in 20 years? Today was Griff's last day of kindergarten! He's very excited for the summer, happy to get to spend more time with me (and not miss out on adventures I have with his brothers), but also a little sad not to see his friends every day any more. I went to his classroom with Reese and Xander in tow rather than wait outside to pick Griff up, and got a few snaps of him with his teachers (Ms. Falkes the classroom aide on the left, Ms. Callis on the right). Ms. Falkes is holding up a one: first grade, baby! Can you believe it? And Griff, holding up a finger in victory. Maybe in first grade the curriculum includes index finger use? I had no idea I would enjoy it as much as I did! The Mary Munford kindergarten classes put on a great little musical show - five numbers, four of which featured one section of kids dancing up front. Griff's group had a song that included two great jokes, which is just perfect for my riddle-lover. Griff was front and center, although the photos are blurry because I was so far back in the auditorium. A slide show followed featuring something each child loved about kindergarten (hmmm, familiar from their last homework assignment...) Jokes after the snapshots! What sits on the bottom of the ocean and shakes?